Today I came to a conclusion. One I have been ignoring for a long time. One I have refused to admit to myself. It is much easier to walk if I use a walking stick. It is safer to walk if I use a walking stick. I am more balanced, less likely to fall down, and more importantly, people are less likely to bump into me, or jostle me, and inadvertently cause me pain, or to fall. There are days when I need a walking stick to walk. I have been stubbornly refusing to use my stick. I bought it, then promptly hid it away where no one could see. I told myself the people I was with would be embarrassed. My kids would be embarrassed. My friends would be embarrassed. People will stare. People will think I am faking. People will feel sorry for me. People will treat me differently. It’s none of that. It’s me. I am ashamed. Like, somehow this is all my fault. Like, if I was stronger, tougher, I wouldn’t need a stick. I should be able to manage. Push through the pain. I am strong. I cannot admit defeat. I cannot show weakness. I do NOT want sympathy. I don’t know. I have always been fiercely independent. My entire adult life I have never relied on anyone. I have gotten myself into trouble, and I’ve gotten myself back out. On my own. No help required. No (figurative) walking stick. While we are no longer living together, since we separated, my husband has become a very good friend. For this I am thankful. So I apologised to him. He was fine with it. I was sure he wasn’t, but he assured me he was. It was actually *me* who wasn’t fine with it. I was ashamed. I felt like I was weak. Like I was admitting defeat. That RA has beaten me. This is all complete and utter rubbish. The truth is the walking stick helped very much. Few people noticed. One of the teachers did, and very kindly directed me to a chair. She brought me an information pack, and assured me that if I did not feel well, I should go home. All the information was in the pack and I could email her any questions. She was very kind. And now she knows I have a chronic pain condition. And she helped me. I appreciated the help immensely. Because of the walking stick. Last night the walking stick spoke for me. It told people that I have a physical problem. That I need help. Something I am still completely unable to admit aloud. And it helped me to walk. What an awesome message this is. Thank you for saying what is so hard for all of us. Thank YOU, C. I’m realising now that lots of us feel the exact same thing. And at least I feel less alone. I think think is a great article- and i believe that using the walking stick will only make your life easier. We all have to make horrible chages to deal with our RA and LIVE- I have a disabled parking sticker which I use on bad days, and if i am going out for the day ie- shopping or theme park etc, I book and use a wheelchair. I hate it, i feel ashamed, i feel useless and embrassed- BUT my kids love the day out and do not care that I am in a wheelchair- they love just having time doing things with mum. And most importantly it tells other people that you need them to adjust for you, and that is important. I have often complained about those around me not moving, making me wait, knocking me on stairs as they whiz past or hurring to get round me, but they have no idea I am ready to scream with pain, so its not there fault.I DO NOT WANT SPECIAL TREATMENT-BUT MY RA NEEDS IT, and so until I am cured(lol-hahaha) I will adjust and chose to live rather than not adjust and stay at home!! Full points to you for covering these issues, and allowing us to vent! Sarah, your attitude is awesome. I admire you very much! You’re so right, the priority is *living* the best life we can. And being able to do things with our children is far more important than pride. Thanks for adding your points…it has helped me, and I’m sure others too. Yup I’ve been here too! The thing is without a stick/chair/parking badge we are as invisible as our disease, our needs aren’t recognized & we tend to struggle on regardless. I remember when my hips deteriorated (secondary OA), one morning I was out with Mum shopping and I’d been thinking about getting a stick but putting it off, for all of the same reasons that you mentioned. The pain was so bad that I stopped in town and picked up a cheap wooden stick, just to see if it helped any. I felt embarrassed and not just for myself but for Mum and my kids, but truthfully my kids thought it was cool!! Did it help? Boy did it ever help, to the extent that I came home and went to switchsticks and ordered a cool candy cane coloured folding one. I’d always said to my best friend that if I ‘had’ to give in and get one that it’d have to look cool!! She’d found me a website and I’d looked but not been brave enough to order, until that day. It took a while to get used to having it with me but to be honest it was only when I started using one that I noticed just how many others also use them. Now I go nowhere without it, it does help me to walk with less pain, it does help people to realise that I may need a chair at a meeting or on a bus/train, or I may appreciate a door being held open for me or just a little space and time to get up and down stairs. It makes my ‘chronic disease’ visible and therefore makes my life that little bit easier. I had the same feelings when I realised that I would occasionally need to use a wheelchair, that was even harder for me to admit, but these days when we go for a family day out where a lot of walking is involved I know that by my using one, my kids, husband and myself will enjoy the day more because I’m not limping along slowly behind in agony. My kids even like to take a turn pushing me & we make it into a giggle as my son makes me do wheelies!! In short I’ve come to the conclusion that whatever makes our lives that bit easier, more comfortable is worth doing. We shouldn’t feel ashamed or embaressed but empowered that because of these helpful things, we are able to enjoy more than we would without them. My husband hates to park us in the disabled spots because he gets the fishy eye as an able bodied person. But he does it anyway and that helps when I need it. If I needed to use a cane it would be one with the specially moulded hand grips for people with hand trouble. However even those are too difficult to grip so I use the “Canadian crutch” or forearm crutch. That way I can lean on it as well. You and the the commenters make so much sense. It was excellent that your cane did the talking for you. It sounds like a good short cut for help and understanding. You’re absolutely right Jen – I love your philosophy. Thankyou so much – all the best back to you as well. I am 22 and have rheumatoid arthritis. This is a very powerful entry for me thinking about what I will need to do in order to maintain mobility. I fear the walking stick and everything it represents as well and I hope that the medicine I take keeps working. Eventually I will have to admit that my lifestyle, family choices, career and how I move around will all depend on this disease which I did not pick. Stay strong and you’re in my prayers. Thankyou so much Samantha – you’re in my thoughts also. 22! That is so not fair 🙁 No one deserves RA, but it is even harder when you are so young. What meds are you on? I hope they keep working too!!! And you never have the walking stick dilemna. Your life, family and career choices will unfold…I hope that RA is not the deciding factor. Good luck!!! This blog has been very helpful. I have had RA for around 10 years. Over the past year my mobility has deteriorated, but I have struggled on not wanting to ‘give in’ and admit I need a stick. My employers sent me to OH, I think to cover themselves with H&S mainly. The OH doctor asked about any aids I use, so I said that I see using a stick as admitting defeat – he kindly pointed out, in his opinion, I need to use one and that I’m making life harder for myself by not using one! So I came home and looked on the internet for walking sticks – just to be baffled at how many different sticks there are!! I am only in my 40s and work in a secondary school so don’t want something too fuddy duddy – can anyone suggest any websites that sell ‘modern’ looking sticks? Thank you. I hear ya! Its hard not to see it as ‘giving in’. It takes time, and I admit I still struggle with it. 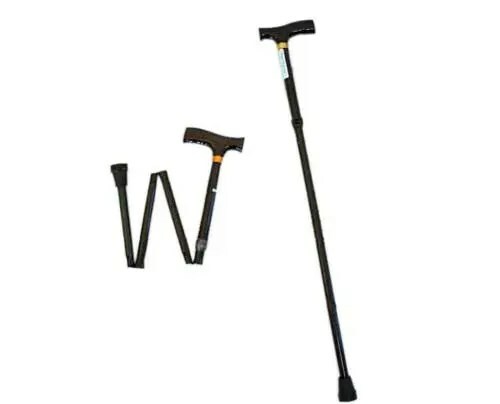 I’ve also ‘moved up’ and bought myself a set of Canadian crutches…they are even better than the stick. They put less pressure you my wrists, and the arm loop means I don’t ever drop them! I should write a blog about those! As for modern, fun sticks…I’m not sure. But there are some cool tapes you can use to decorate your stick, and make it unique. I will dig out some ideas and post later!